Happy New Year! I would like to encourage you to start 2008 with a fantastic show opening at Paper Boat Boutique & Gallery Friday, January 4th from 7-10pm. Providence based artist, filmmaker, and performer Xander Marrow will be joining us in Milwaukee, her show Tucker Neath’ the Covers will run through January 30th, 2008 and should not be missed. It’s a treat to have her work on display and I hope you get a chance to check it out! Paper Boat Boutique & Gallery:: 2375 S. Howell Ave, Milwaukee, WI. I first met Xander Marrow in the summer of 2003 when, by chance, I booked a show for her touring puppet theater in Milwaukee. She performed her piece the Birdsongs of the Baharoque and bizarre and dreamy performance that utilized puppets, song, dance, film, lectures, sets, lights & costumes. I was sent a package of posters to help promote the show. This was not like any other press kit I have ever received. Enclosed were the most shockingly beautiful silk-screened posters I had ever seen. Layers of pinks, reds and gold made up a striking advert for the soon to come performance. To this day the poster is a work of art I treasure, hung at my home. This was my first taste of the silkscreen work of Xander Marro. Skip to 2006 I was in Providence, RI shooting footage for my upcoming documentary Handmade Nation and I had arranged a visit the Dirt Palace, a collectively run feminist art space that Xander is the founding member of. The entire building (an old library) houses up to seven artists who work in a variety of mediums, sharing studio space, performance rooms and housing a store front gallery installation space. While getting a tour at the Dirt Palace and seeing the amazing worked it housed, a library, darkroom, printing studio, performance space to name a few, I was shown the guest room. In the guest room was one of the most beautiful things I had ever seen, laid out on the bed, a quilt. But this was no ordinary quilt; it was a red, and velvety, a patchwork quilt that had the art of Xander Marro interwoven within itself. When I asked about the piece Xander replied with an explanation along the lines of “Every time I print poster or a design on paper I also print it on fabric, then I piece the fabric squares together and make quilts”. Xander's artwork had taken on a new form in my eyes and the beauty of her illustrated work was now also a functional piece of art, laying there for guests to curl up within its designs. Xander will be joining us from Providence to install her show which will include two finished quilts, a site specific installation of the Museum of Very Small Things, and affordable pieces of silk screened fabric for you to work into your own quilts or hang on your wall! Xander Marro (American b. 1975) is a fake scientist/olde style tinker residing at the dirt palace; a feminist cupcake encrusted netherworld located along the dioxin filled banks of the Woonasquatucket river (which is to say in Providence, RI USA). From this post she makes movies, puppet shows, prints and phone calls. Her adventures underground have included curating the “Movies with Live Soundtracks” film series and performing in various theatrick/musical formats as one of the variety of her alter ego’s (Madame Von Temper Tantrum, Lady Long Arms, Lil Blood-n-Guts, Madame Von Malt Liquor etc.) Of recent days she has gotten herself deep into the wild world of community organizing around neighborhood social justice and human rights issues. The last few weeks have been a Holiday blur! First and foremost if you haven't seen the article Handmade 2.0 that Rob Walker wrote that was in the New York Times this past Sunday check it out HERE. I am quoted along with tons of other crafty folks!! My show I coordinate in Milwaukee Art vs. Craft went off without a hitch! 2300 people all came out to shop, there was a line outside for the first few hours (p.s. it was 20 degrees outside! ), vendors sold out of merh, basically the event was a huge success. this morning, we got our first edit back and things with the book are shaping up super well! On page 45 you can learn how to make Rock Candy, another thing that reminds me of my youth. My 6th grade science teacher, Mr. Jones, actually incorporated Rock Candy into our class and since I was never allowed to eat sugar at home he was my favorite teacher from that day on. On page 129 there is a section on letter writing. I am a big fan of the snail mail and think it is very important. In fact my 2007 New Years Resolution was to write a letter a week. I didn't quite stay on track, so any reminders to pick up a pen and paper vs. email is a big plus in my book! And in lieu of our first heavy snow here in Wisconsin I will give a shout-out to page 174, which talks about finding a sledding hill. Those of you who live in cold yet urban setting may know this is harder than it may seem. But when the perfect hill is discovered (and you beat the neighborhood kids to it) nothing rules more! 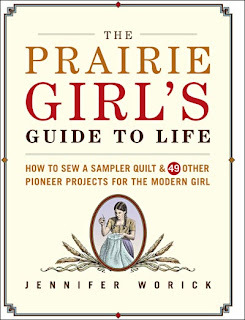 I think this book is super sweet and a good addition to any crafty lady's library, I also think it's fit for all ages because I know that when I discovered Little House on the Prairie anything to take me back to that time was appreciated! 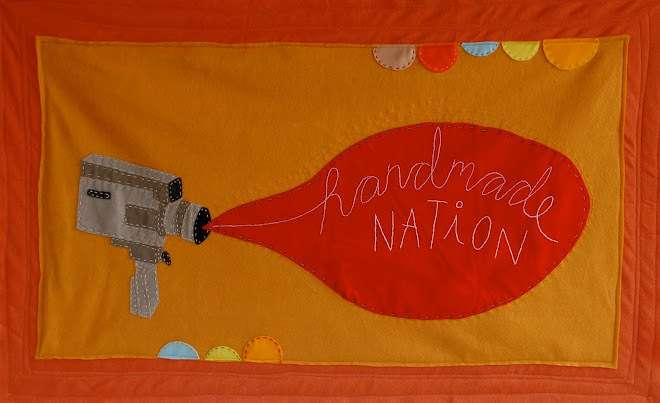 The 2007 Fall/Winter Oregon Humanities Journal has a great article by Jamie Passaro titled "Handmade and Proud", I just discovered you can read it online HERE. I'd be curious to know what you think. Here is a quick picture of C.Taylor photographing Cortney for our author pictures for the book a few weeks back!